While the last several weeks have been busy with the Christmas rush and year-end chores, I've added several pairs of cufflinks to the Antique Cufflink Gallery. I hope everyone enjoyed the best of the holidays and is looking forward to a joyous New Year! Art Deco cocktail glass cufflinks, circa 1930. We enjoyed a very busy December at the Antique Cufflink Gallery and over the next several months will be "restocking the shelves" with elegant cufflinks and dress sets from the past. The Art Deco cocktail glass cufflinks pictured above are a striking example of coming attractions. 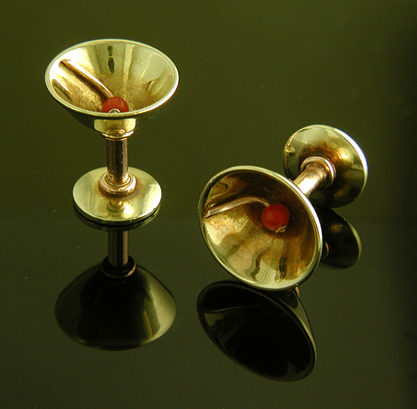 Crafted in 14kt gold and set with coral cherries these beautifully crafted cufflinks date from the years around 1930. Bottoms up! I hope everyone enjoys a happy and joyous New Year!